“Is it going to hurt, doc?” But don’t worry. Much like the annual flu shot, you’re going to feel some slight discomfort building an ADA-compliant site, but before you know it, it’s all done. What is ADA? ADA stands for Americans with Disabilities Act. And while the Department of Justice (DOJ), which enforces the ADA, probably won’t amend the law’s language to include websites until 2018, you shouldn’t wait until then to make your website ADA-compliant. It isn’t just the right thing to do; it’s the smart thing to do. Nearly 20% of the U.S. population has a disability. You wouldn’t dream of having an elevated storefront without an entrance ramp. You know you’re losing sales. The same mentality goes for your website. Level A. Level A includes having alternate text to describe photos for those who are visually impaired and use e-readers, and that everything is keyboard accessible and navigation is consistent and logical. In my opinion, Level A should be considered the minimum applied to any website developed these days. ADA compliance promotes good SEO practices (so your site can be found on search engines) and ensures the site points toward successful engagement with clients and customers. Level AA. Colors and contrast are considered for individuals who are colorblind or have other visual impairments. Videos incorporate closed-captioning. Fonts are scalable. This level is where site developers begin to truly tailor site design and functionality to those with a disability. Level AAA. This is the strictest standard of ADA practice. This level addresses the needs of visitors with the most severe disabilities as it drastically restricts design, experience, and even the education level of the web content. 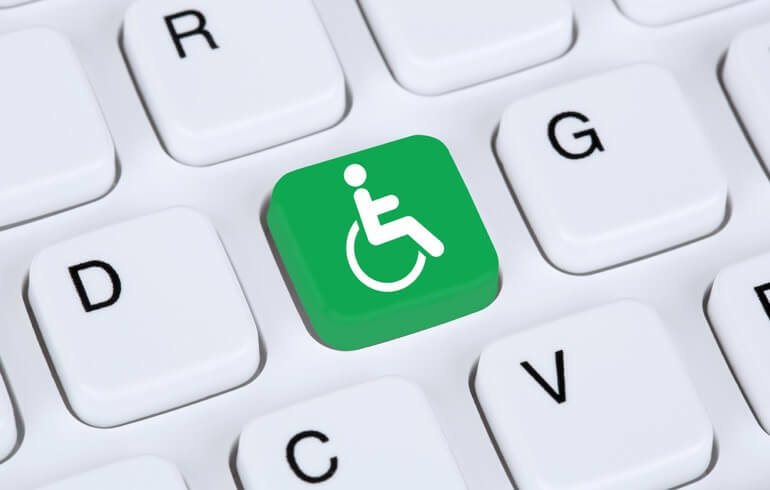 Websites that provide products and services more geared to individuals with disabilities should embrace this higher standard of ADA practice. While ADA standards for websites continue to be defined, and Internet chatter continues about the official date the DOJ will begin enforcement, the time to consider these standards is now. Want to know more? You’ll find a more detail breakdown of the three levels here.